Putting together a stereo can be intimidating, but it doesn't have to be. The process of building a stereo can be overwhelming. Should you buy new gear or trawl the local stereo shop for vintage equipment? Do you need a subwoofer for music? Are high-end speaker cables really going to make a difference in sound? It's no wonder, then, that smart speakers have become so popular: They're available in a variety of sizes and, when paired with a music streaming subscription, are a simple way to access a world of music. But the trade-off for that convenience is sound quality. While an Echo or HomePod is perfect for listening to podcasts, it can't stack up to the power and fidelity you get with a traditional stereo. If you're looking to upgrade, rather than ponying up $500 for a single Google Home Max, consider an alternative solution: building your own stereo HiFi system. While the initial setup and research are more intensive than simply telling Alexa to order more Echo Dots, after it's done you'll have a much more versatile -- not to mention better-sounding -- way to listen to music at home. We aren't going to debate the merits of which sounds better in this piece, but it's important to talk about the differences between analog and digital. For stereo purists, there's nothing better than using woven copper cable and RCA jacks to connect their gear. But if you want the best sound, the quality of the connection counts, and that factor can be influenced by everything from the length of speaker wire you're using to how much magnetic interference is in your home. Stereo gear isn't required to offer anything beyond analog inputs, and for purists who want to keep it as old-school as possible, that's a big draw. However, analog gear does have a shortcoming: Some older equipment can take time to fully "warm up" before it achieves peak sound quality. On the other hand, digital signals don't fall prey to these sorts of things. They're binary, meaning there's no quality difference depending on the type of cable you buy or how long a piece of equipment has been turned on. A digital signal either works or it doesn't -- there's no in between. If you're going to use passive speakers, you'll need an amplifier to power them. But should you get a stereo receiver or an integrated amp? That depends on how much you listen to AM/FM radio. A receiver is a receiver because, well, it's receiving broadcast signals. It still has an amplifier built in, but there's a radio tuner inside as well. If you'd rather skip that, look for an integrated amp. It's really that simple. There can be a few benefits in choosing an amp over a receiver too, like cleaner design and smaller overall size. That's in addition to not spending money on a feature you may ultimately never use. There has been plenty of digital ink spilled about the merits of old gear. Cases are made from solid chunks of machined aluminum and wood rather than flimsy plastic and wood-grain veneer. How it feels to turn the various knobs and dials was given as much consideration as visual design. And then there's the sound-quality-to-price ratio. A good used amp or receiver built in the 1970s or '80s (the heydey of HiFi) shouldn't cost much more than $300 to $400, and it can blow the doors off brand-new equipment costing much more, every day of the week. Modern equipment places more emphasis on features than it does sound. That's because most people usually don't listen to their gear before they buy it these days. It's why you should hit your local stereo shop instead of Best Buy: Any boutique worth its salt will let you demo its stock before you walk out the door with it, in addition to having extremely knowledgeable salespeople. A good local store will help you pick the right system and components for your needs too. Many offer package deals with an amp or receiver, speakers and a turntable for around $500, with a warranty as well. Some stores offer online sales in case you don't have any local options. Alternatively, you could hit a garage sale or a thrift shop, or go digging through your parents' attic to see if they have anything lying around. Or you could start trawling eBay or Craigslist. The risk with these options is that it's hard to gauge whether you've found a gem or a piece of junk until you get it home. Even the best equipment needs some love after collecting dust for 30 years, and you could wind up sinking as much money into maintenance and repairs as it would have cost to buy from a local store in the first place. Old equipment does have a few drawbacks, though -- namely, its size and lack of modern conveniences. Plenty of vintage stereo amps and receivers make 17-inch desktop replacement laptops look downright dainty, which poses a problem in smaller living spaces and when you're looking for a component rack to hold everything. Oh, and in addition to getting up to flip a record every 20 minutes, you'll need to do so every time you want to adjust the volume or change the input, as wireless remote controls didn't become ubiquitous until the late '80s. Assuming that creature comforts are a deciding factor, perhaps buying brand-new gear is your best option. Just know that there's likely going to be a trade-off between size and sound quality. For a simple, compact integrated amp, the Pioneer Elite A-20 (right) looks good and delivers solid sound for $300, with 50 watts per channel and enough inputs (including a powered phono input) that connecting a turntable, a CD player, and a Chromecast Audio or Bluetooth dongle won't be an issue. However, if you're looking to add an equalizer into the mix for granular audio control, it doesn't have the proper inputs. If you'd rather go the receiver route, in addition to tuners for AM/FM signals, many modern receivers have AirPlay, Bluetooth, Chromecast and WiFi (or a combination of the four) built in. Our friends at Wirecutter are big fans of Sony's STR-DH190. It's less than $150 on Amazon as of this writing, and the publication says it's "a good fit whether you're embracing the future or reveling in retro." It has 100 watts per channel, the option for connecting another set of speakers for multi-room audio, powered phono (turntable) input and built-in Bluetooth that'll wake the receiver when you start a listening session on your mobile device. We've only grazed the surface on new gear, but if you still have questions (or would like an Amazon alternative), hit up Crutchfield. The company has been selling speakers, audio equipment and home theater gear since 1974. In those 45 years, it's earned a stellar reputation for its customer service. Every purchase is backed by lifetime tech support, free shipping on orders over $35 and price guarantees should your new speakers get a discount after you bought them. More than that, Crutchfield's experts love talking audio and will happily help you pick out the best that you can afford. Much like having a few choices for amps, there are different options for speakers. We're going to focus on four types: bookshelf, floor-standing, active and passive. Bookshelf speakers are great because, unlike the floor-standing variety, they're more compact and easier to place in a room. Typically each speaker has two to three drivers and is small enough to fit on your desk or, well, a bookshelf. What they lack in size they can make up for in sound quality, often featuring two or three drivers that dwarf the size of anything from Amazon, Apple or Google. Where they fall short, though, is bass reproduction. Their diminutive stature means less space in the cabinet for large woofers, so you can't expect bookshelf speakers to have the same sound as a set of towers, and many can't play as loud either. If you find them inadequate, though, you can always add an external subwoofer down the road. Floor-standing speakers, on the other hand, have their own set of shortcomings. Most obvious are their size and price. While you can tuck bookshelf speakers away, their floor-standing counterparts are, as their name suggests, big enough to stand on their own. As such, they can dominate a room visually as well as sonically. Their bigger footprint means that air has more room to move around inside the cabinet, and thus they can produce fuller, richer audio than other types of speakers. The benefit is that if you pick the right floor-standers, you can probably forgo a subwoofer, for a cleaner, simpler setup. In addition to woofers for bass, plenty of floor-standing speakers (like towers) pack in upwards of three drivers for a clear midrange and treble. 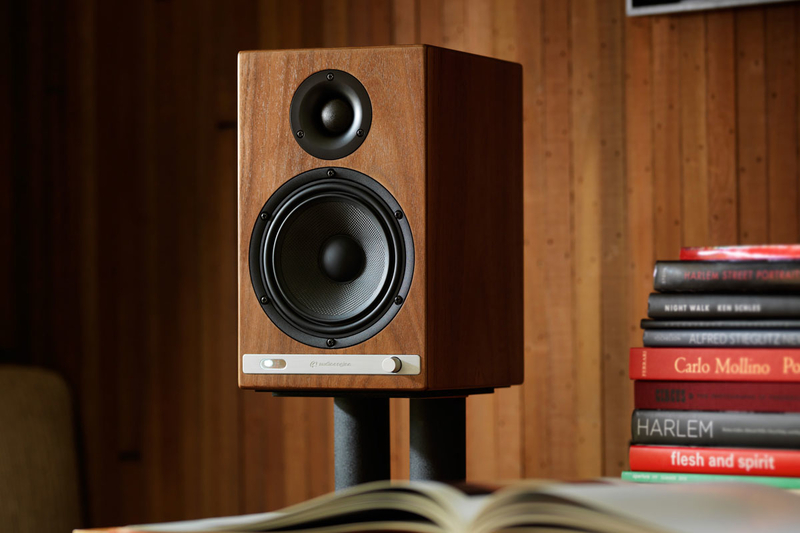 You can get a decent pair of bookshelf speakers for around $300, but brand-new towers can cost anywhere between hundreds and thousands of dollars each. Again, it's worth visiting your local shop to browse their stock and decide what sounds best. Bring in your favorite music, be it a CD, a record or your smartphone, and pick the pair that sounds best with what you typically listen to. Chances are you'll be surprised at what a good set of speakers can reveal in albums you've cherished for decades. The next step after that is figuring out which ones sound great and agree with your budget. All of the speakers we've talked about thus far require an external power source for them to reproduce sound. As such, they're passive. Active speakers like the AudioEngine HD6 (below) have amplifiers built in, which can save time and money, not to mention space. Sources like turntables and CD players plug directly into the speakers, or, in the case of Spotify, for example, wirelessly, without the need for additional dongles. They also have the potential to sound better than passive speakers, because in ideal situations the amplifier is matched to the drivers' capabilities. Meaning they've been designed in a vacuum to pump out the best possible sound. However, active speakers are less flexible and tend to cost more. With passive speakers and an amp, if you don't like the way the speakers sound, you can easily replace those rather than the entire setup. With active speakers, by design, that isn't possible -- you'll have to start from scratch each time until you find speakers that you like. Additionally, each speaker will need its own power source, so placement can be limited by the number of electrical outlets in your space. If you're going for passive speakers, you need wire. There have been countless blind tests pitting "premium" speaker wire against no-name copper, and most people can't tell the difference, not even if it's a contest between wire coat hangers and Monster Cables. As a general rule, you shouldn't need anything fancier than 12-gauge multi-strand copper wire. A 100-foot spool of 12-gauge shouldn't cost you much more than $30. If you're running a particularly high-powered system and need longer than 50-foot runs, just buy heavier wire. Just because you're buying dumb old gear doesn't mean you can't smarten it up. Whether it's an inexpensive solution like a $35 Chromecast Audio (below) or a similarly priced Bluetooth dongle, it isn't all that difficult to play your digital music collection through your stereo. Apple fans can pick up an AirPort Express Base Station for $99 to easily add Cupertino's wireless technology to their existing setups. Regardless of which you choose, connecting any of the above to an amp or receiver is as simple as hooking a set of RCA cables from the device into an empty input. With the AirPort, though, you'll need to provide your own mini-stereo-to-dual-RCA jack cable. If you're really committed and would rather not deal with the limitations of those options, you could opt for the Sonos Connect. At $349, it's dramatically more expensive than either a Bluetooth dongle or Chromecast Audio, but that investment will allow you to add music streaming to your existing setup (it needs to be powered) and will put all of your tunes around the entire house via WiFi. It also opens up an easy option for adding multi-room audio to your home by adding additional Sonos speakers as you can afford them. Hopefully, by this point the idea of building a stereo is a lot less daunting and you feel confident enough to walk into your local stereo shop to start browsing. There is a lot to consider still (picking out components, mostly), but at this point it comes down to personal preferences. Have any tips we might've missed? Leave them in the comments below. Happy listening!